Real Role Models Do Monkey Bars! 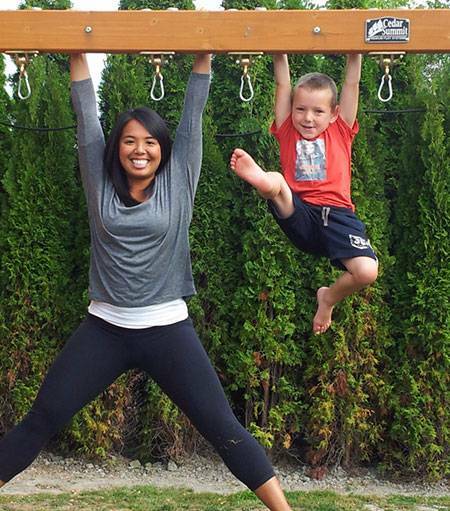 Pediatric Physiotherapist at Kids Physio Group Vancouver! Written for OrthoCanada Blog, to be published! !!! Throughout my life thus far, I’ve been fortunate to be surrounded by incredible people that have been my role models and have shaped me into the person that I am today. My parents, senior members of my childhood church, passionate school teachers, caring employers, and countless wise and witty friends have all inspired me, and are continually pushing me to become a better person in all aspects of my life. !!! In my quiet time reflecting on how each person has influenced me, I came to a realization about what the above groups of people have in common: they are all older than me. But that makes sense, doesn’t it? People who have been in the game longer know it better. Right? ! !! This may be true for certain aspects of life; previous generations are more experienced in their careers, marriages, and child-rearing, and therefore society often looks to these people for knowledge and advice. ! !! But there are two crucial facets of life that perhaps these older groups are not well-versed in: authenticity and movement. ! !! course this is the accepted professional level of conduct but I can’t help but think about how many of these people are also like this in their day-to-day lives. ! !! Over the past three years working with children, they’ve shown me something marvellous: they are SO true to their emotions. They say what they mean, and wear their hearts on their sleeves. ! !! Even though the expression of these emotions is often still raw and unrefined (I often have to remind kids to use their ‘inside voice’, and just the other day I witnessed one of the most epic meltdowns by a 3-year-old who wanted to take one of our toys home and couldn’t), they still are important role models of self-expression. We need to remember how to accurately display how we feel (minus the meltdowns) and stop stifling our emotions to save face. Say something when you don’t agree, rather than nodding your head to please people. Cry freely when you’re upset, or actually jump for joy. LOL and even ROTFL, and hug suuuper tight. Be authentic, be genuine, be real.! !!!! As a pediatric physiotherapist, I’m lucky to have the opportunity to observe how children move on a daily basis. Parents will often sit in on sessions and I encourage them to actively participate in some games. One day, I was playing a game of crab soccer with a 6-year-old (supporting yourself on your hands and feet with your belly button face up and bum off the ground, kicking a soccer ball around). This young boy asked to face-off with his observing grandmother, who simply dismissed the invitation, stating “Oh honey, Grandma is too old to get on the ground”. As people get older, many of them have lost the ability to move the way nature intended and this is wreaking havoc on their bodies.! !! As toddlers, we all learned how to develop strength, maintain mobility, and participate in functional daily activities. Our western society then introduced sitting in chairs, stagnant forms of entertainment through technology and media, and convenient methods of transportation that have actually limited our need to move. The loss of this regular movement can lead to issues such as bulged spinal discs, hip osteoarthritis, and eventual knee replacements. ! !! The obvious role models in the world of fitness are professional athletes: Venus and Serena Williams, Michael Phelps, and Lionel Messi all push the envelope in their separate sports and we admire their talent, dedication, and skill. But let’s not forget the little beings around us that can sprint, crawl, squat, jump, swing, hang, duck, dip, dive and dodge! Look to the playground for our real movement role models, and admire the physical abilities we all used to possess but may have lost over the years.! !! Life is all about learning and growing in cognitive abilities, personal interactions, and work-related skill. Surrounding ourselves with inspiring individuals is what motivates us to be better. We shouldn’t forget about this special group of little beings in our population nor can we underestimate the lessons these kids can teach us. Next time you spend time with a child, take note of their ability to be authentic and observe how they move their bodies to express that authenticity. ! ! As toddlers, we all learned how to develop strength, maintain mobility, and participate in functional daily activities.